YOU ARE HERE Home News Beverage Industry: How Asmech’s systems help quench the world’s thirst. At Asmech we are proud to be able to help many different industries function and be successful. Our systems provide the efficiency and organisation that numerous product facilities and factories need. This week our blog piece focuses on the work that we do within the beverage industry and the benefits that our systems offer various companies. Most of the systems that Asmech can supply to companies are able function inside a beverage product facility. Below we have put together a brief overview of each system that is most commonly within Beverage industry factories. Slat conveyors’ main use is to transport products from one area to another and are the basis to many major conveying projects in the beverage industry. A great benefit of the slat conveyor is the opportunity of it being fitted with various types of side guides to suit different products, brilliant for product facilities. They are very flexible; many factories use slat conveyors because they can easily move around loops and bends. 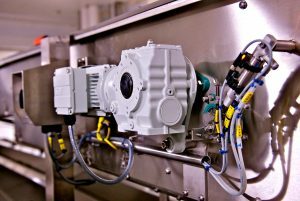 Bottling plants are where slat conveyors are most common. Loop inverters are largely used to change the angle of products for certain periods of time, allowing possible debris to be ejected before filling up the products through air rinsing. A common practice in the beverage industry, several companies have seen the benefit from loop inverter systems, bottles rotate upside down allowing the bottom side of caps to coat, they can then start sterilisation through a hot filling process. Modular belt conveyors are commonly in the beverage industry to convey boxes, trays or shrink-wrap backs of product. Many companies invest in modular belting systems because of the versatility and durability it can provide. Palletiser systems are common within the beverage industry to improve efficiency and packaging times within product facilities. Enhancing packing speed whilst reducing the amount of labor hours needed allows companies to increase their profitability. Businesses that use palletisers decrease the amount of manual handling of the products which prevents breakages caused by human error. At Asmech, we began work with a nutritional beverage company based in Ireland. We were able to produce a conveyor system for them. This system had to sterilise specific bottles caps and cool down the base of the said hot filled bottles. To achieve this, we designed for the company, a loop inverter system. The requirements provided to us stated that; bottles invert by 90 degrees for 3 minutes. Inserting cool water spray at the base of the product and then rotating back. However, due to the precise inversion times requested, a standard loop inverter would not be able to suffice. Our engineers at Asmech designed a solution to invert bottles by 90 degrees from vertical to horizontal and return them to their original alignment. The bottles needed to be horizontal for a total of 11m before the turning procedure. This will be possible over 1.5m by resting bottles between rubber flights on to the slat chain drive in a spiraled belt path. The concept of this solution enabled the line speeds and inversion time requested by the customer to be met. To find out more about the brilliant solution Asmech provided visit our Hot Filling & Bottle Inversion case study. To find out more information about the benefits that our systems can provide, contact us directly on 01623 424 442.